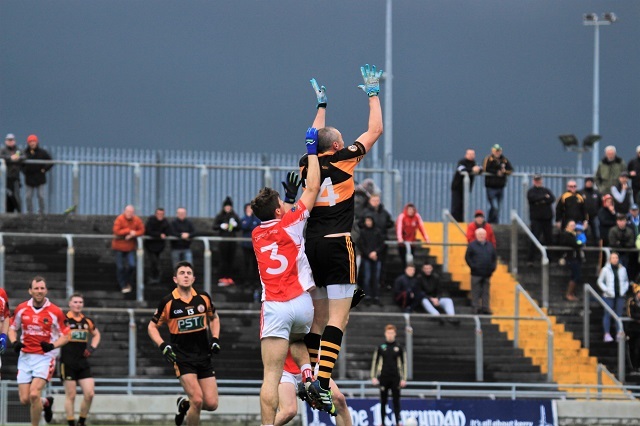 Kerins O’Rahillys made light of the East Kerry challenge in the opening game of the senior football championship double bill at a wet and blustery Austin Stack Park this afternoon. The blues were always in control of this game with the likes of David Moran, Tommy Walsh, and Barry John Keane in superb form throughout and even the inclusion of minor sensation David Clifford could do anything to turn the tide in favour of the men from the East with Moran dominating the middle, Rahillys got the perfect start and were 4 points to 1 ahead inside the opening 8 minutes with Barry John Keane pointing two frees and Tommy Walsh also very involved. The winners could afford the luxury of a missed penalty in the 10th minute – David Moran drove to the right and wide – and the East Kerry goal had another let-off soon after when John Ferguson drove wide after good work by Cormac Coffey and Tommy Walsh. Dara Roche pulled a point back for East Kerry from a free but then Rahillys did what they had been threatening to do – score a goal. It came in the 19th minute when Jack Savage, Tommy Walsh and David Moran combined and the latter it was who sent a fine shot to the East Kerry net. Paudie Clifford pointed for East Kerry and then Jack Sherwood scored a fine goal out of the blue after good work by Dara Roche to leave the score 1-4 to 1-3 in favour of Rahillys. At the other end, Ferguson should have done better after being fed by Tommy Walsh and five minutes later Barry John Keane shot straight at Colin Myers when he looked like goaling. Gavin O’Brien and Keane did point late on and at the break it was 1-7 to 1-4 for the winners. West Kerry got off to a flying start and thereafter Stacks were always playing catchup. The Tralee side could never get a foothold in midfield despite the occasional presence of Kieran Donoghy in that area as Alan Fitzgerald, Rob Ó Sé and Jason Hickson dominated play in that around the middle. Up front, the outstanding Eánna Ó Conchúir, Tomás Ó Sé and Dara Ó Sé were always asking questions of the Stacks defence while at the back, Cathal Ó Lúing and Padraig Ó Sé anchored the centre of defence very well.